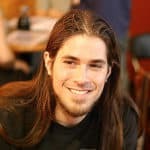 Want to get the most of your brews and get consistent results? Ditch the rule of thumb and spend a little extra cash to get a beer thermometer. They aren’t expensive and provide you with accurate and consistent readings. If you are like me, you have stood in front of the brew kettle watching water boil and feeling the sides to make sure my temperatures were good. Since using beer brewing thermometers, I have been able to focus more on other steps and not worry about my batch turning out poor. There are a few different homebrew thermometers available so make sure you check them out to get the best one that will serve your brewing needs. 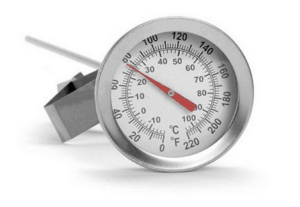 8 What’s the Best Brewing Thermometer? 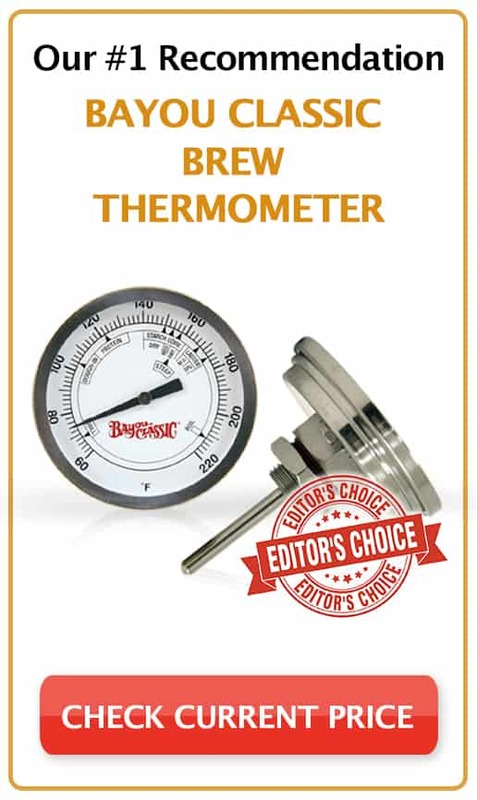 If you are getting a little more serious about home brewing and looking to upgrade your brew kit, I strongly recommend Bayou Classic’s 800-770 Brewing Thermometer. It saves you time from taking readings with a dial and external thermometer. It does this by staying mounted on the side of your brew kettle. Because this unit is designed to be fixed to the side of your stock pot, it provides a constant and consistent reading. Unlike the adhesive thermometers, this one actually has a probe that stems all the way into your brew. The convenience and accuracy of this product is worth the extra cost as it will pay for itself by saving you time and getting accurate results. If you’d like to try what I consider to be the best-of-the-best, then this is the one you want to get. Although this product is intended for food, it is easily used for brewing. It works the same way as all other probe readers, except this one is a digital thermometer for brewing. 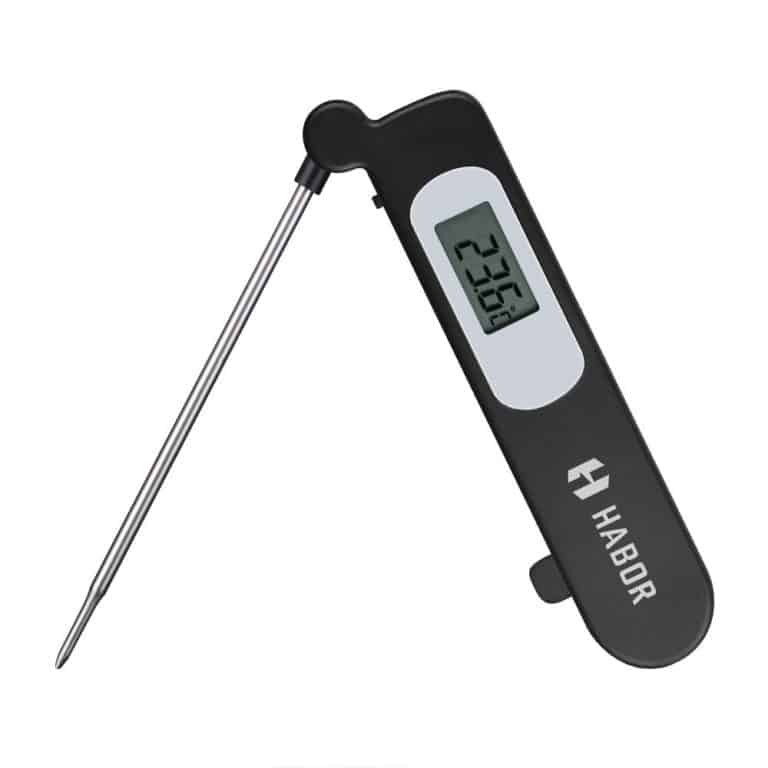 Because the Habor is a digital brewing thermometer (and very similar to the Thermapen MK4), you won’t have to worry about reading a dial, and it measures to the tenth degree. Providing accurate temp readings is essential to getting the results you are looking for. Another good thing about the Habor is that it can be used for whatever you need to measure. As it is ready out of the box, there is no programming required, and you only need to hit the ‘on’ switch. If you want to make sure you’re creating the perfect home brew, I would recommend spending a few extra dollars on this one. If you are looking for something simple that will get the job done, then you don’t need to look any further. The Brewcraft 12″ Ss’ Dial from Home Brew Ohio is very straightforward. It is simple to use and easy to read. This unit comes with a large faced dial that is easy to read and measures temperatures quickly and accurately. All you have to do is place the extra-long probe into your brew and watch the dial go. This will allow you to efficiently regulate your temperatures ensuring that your wort properly seeps and your yeast will be active. If you are looking for a one-stop shop, then this is your go-to. It works like most dial units, but it is also mountable, which can be used as a brew kettle thermometer. Just slap it to the side and you’re good to go. The E.C. 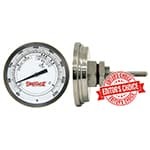 Kraus Big Daddy Dial homebrew thermometer is all you need to ensure that you are getting readings through the entire brew process. The mountable feature makes it easy to monitor your kettle and means that you won’t have to deal with taking multiple trips to the sanitation bucket. You can also easily remove it so that you can use it to take temperatures of your yeast or your fermentation. This adhesive strip thermometer, also known as a ferrometer, is perfect for keeping track of your fermentation temperatures. It attaches right to the side of your fermenter and can remain there for the duration of your primary or secondary fermentation. With a beer thermometer like this, you will be able to quickly and easily take a reading. The Ferrometer isn’t going be able to measure your boils but I like it so much I have one on the side of each of my primary and secondary fermenters. All I have to do is check the side and log the temperature. The convenience of this has saved me a couple of times when the temperature of our basement suddenly dropped. Mounted thermometers are very convenient and provide constant feedback. They are designed for ease of use, making sure that you can keep your brew at the correct temperature. They are simple to use, easy to read, and once they are mounted, you will only have to sanitize it before the next batch. The only downside is they are meant to stay in place and may not be used to take measurements of many things at a time. 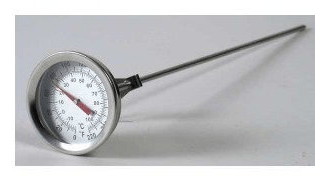 Unmounted thermometers are versatile and can be used to take readings of whatever you need. You will only need one to measure everything from beginning to end. They are ready to use out of the box and are easy to clean. However, you may find it tedious to sanitize between readings continuously. Brewing supplies – do you have all these essential equipment on our list? Brewing kits – perfect for beginners who want to try brewing for the first time. Monthly beer clubs – award-winning, hard-to-find unique beers delivered to your door. What’s the Best Brewing Thermometer? If you need a temperature reader for your home brew, I would recommend the Bayou Classic Brew Thermometer. The convenience and accuracy of this product is really what I use a majority of the time. However, if you want to take your home brew game one step further, get a combination of an adhesive and an unmounted analog thermometer. Analog readings make me feel confident I am getting an accurate reading, and its versatility means I can use it whenever and wherever needed. However, I find it difficult to use a probing unit to verify my fermentation temps. It is a hassle to remove the bubbler or airlock from my carboy and reach the probe to the fill level. For this reason, I also use an adhesive thermometer. That way, there is no need for additional sanitation, and I only have to mark the temp. This combination is really all that you need.